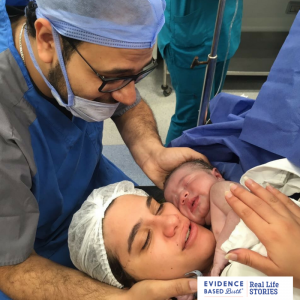 Below are real life stories submitted by people around the world for our recently published Article – The Evidence for Skin-to-Skin Care after a Cesarean. 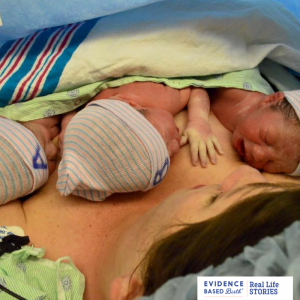 I had an induction-turned-cesarean at 39+2 with my fraternal twins. We requested skin-to-skin and an additional support person (my doula) in the OR. While other staff were hesitant about both requests, the doctor was very respectful of both wishes. My birth was very traumatic and devastating for me, but those moments of skin-to-skin were very special and sweet. With my son (second planned c-section), my midwife pushed for skin to skin right away after the c-section. My midwife also pushed for the doctors to lower the drape when my son was being pulled out. I wasn’t able to see the incision or anything gross but i was able to see my son right away. Seeing him come out and being able to do skin to skin in the operating room was extremely special and made the experience much more personable. This was my first pregnancy and I was to be induced for reasons out of my control. My midwife knew it was important to me to have as close to a nature birth as possible. There were benefits to both mom and baby I thought to be exclusive to a natural birth at the time. 36 hours of little to no progression after all the steps taken, I knew a c-section was where I was headed. I was prepared with an emergency birth plan that included immediate skin to skin with me or dad if I wasn’t able to for any reason. Of course I had reactions to the medication that prevented me from being able to hold or embrace my baby right away. But we found a way to have him on my chest still until I could. I am so thankful to have found out that skin to skin and immediate nursing were not exclusive to a “ natural birth” and I wouldn’t change a thing. After 4 days of active labor, I surrendered my dream of a homebirth and transferred to the hospital as it was obvious that something was not right and my baby needed assistance. I labored for a little under twelve hours at the hospital, three of those on pitocin, before making the call for a cesarean. My hospital team was incredibly kind and gentle with me. They asked me what kind of birth I had planned originally so that they could stick to that plan as much as possible despite the circumstances. They did not have a clear drape readily available, but right after pulling my daughter out they handed her directly to me and we had skin to skin time until she needed to be suctioned (her breathing became labored). It was beautiful and a moment that I reflect on with much happiness, even though her birth was traumatic. She was brought to me in our recovery room very quickly where we had more skin to skin time and breastfeeding began immediately. 10.23.17 One year ago today my baby girl was born via a (reluctantly) planned C-section. I found out my baby was footling breech just before 34 weeks. I dove headfirst into any and all attempts to get baby girl head down – Spinning Babies, chiropractic care, acupuncture, Hypnobirthing and even two ECVs. Despite the excitement surrounding us, imminently welcoming our first child into the world, I felt devastated. There was a true feeling of panic, loss and heart break. I’d done some reading on the “gentle” C-section. When my care provider could not guarantee the type of C-section I was asking for, knowing very well that it was being practiced at another local hospital, I left. I sought out a caring and empathetic provider who not only agreed to my birth plan, but assured me that this was her normal C-section procedure. With the passing of a full year, the pain I feel at not having the birth I so wanted has lessened. But I still mourn that loss and what I’ve learned from therapy and self-reflection is that it’s ok to feel both immense joy at the birth of my beautiful baby as well as sadness and grief for the birth I’d hoped for. If there is anything that I could impress upon my fellow expecting mamas, it is to ADVOCATE – for yourself, for your baby, for your family. You deserve the opportunity to make the best decisions possible. When I didn’t get the answers I personally needed, I found a new doctor at 39 weeks! I am proud of that decision, I am proud of every question I asked, every “no” I pushed back on. One day I will tell my daughter about her birth and I will make sure to include the bravery with which I brought her into this world. This picture is just before she was placed on my chest, skin-to-skin. I love seeing her newborn body grasping for me, her little hand curling over my nose. She knew me right away! We had a planned Cesarean after waiting two weeks for labor to start. My doctor monitored me very closely for those two-weeks. He was very patient as he knew I wanted to have a natural birth. After no signs of labor, no contractions, the baby didn’t drop, nothing my doctor asked me to get an ultrasound to make sure I still had enough fluid and the baby was ok. My husband and I went in for the ultrasound and everything was normal. I had plenty of fluid and he seemed happy in there. He was on the bigger side and he had a lot of hair, which we saw floating around his head. At that point my doctor said nothing is happening other than he is getting bigger. My doctor also said that due to my lack of labor signs inducing me would only result in some long hard labor pains, which would probably just result in me having to have a Cesarean after exhausting labor. My husband and I talked it over and decided to have a Cesarean. It wasn’t a hard decision, but it was a very demoralizing decision. I called my sister-in-law, who is a doula, to get a second opinion of someone who was like minded. After hearing all the details she agreed, which made me feel a little better. Having to have a Cesarean was the complete opposite of what my birth plan was. My entire pregnancy I didn’t think twice about having a natural birth. Birth is natural, it just makes sense. But that wasn’t my plan after all. After somewhat coming to terms with a Cesarean, my doctor told me about a trial program at the hospital I was giving birth. It was skin-to-skin in the operating room, I was so excited. It gave me some peace of mind. Walking into the hospital and waiting in the waiting room to have a baby was a little surreal. We were excited and nervous like any soon-to-be-parents are. 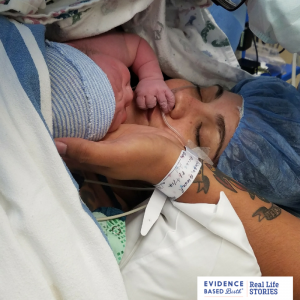 We settled into our room and as I was being monitored, hooked up and briefed on what would happen I mentioned to the head nurse that our doctor said we could have skin-to-skin in the operating room after the baby was born. The nurse was not happy and said there was too much involved and they wouldn’t do it. Then they wheeled me away to the operating room. I was so upset. Little did I know that my husband was not letting it go and fighting for the start in life we wanted our baby to have. He talked to the nurse, who didn’t budge on her decision. Desperate to find someone who would listen he talked to the anesthesiologist. The anesthesiologist happened to be the head of anesthesiology of the hospital and was just as upset as us when he heard the situation. He spoke to the nurse and spoke to everyone in the room before my doctor got there and he made it happen. While I didn’t get the natural birth I wanted, we had a healthy, happy baby boy. And with the help of the medical professionals we were able to have the skin-to-skin after he was born. It was amazing. There was so much commotion in the operating room, but having him there on my chest was amazing. That is all I was focused on. 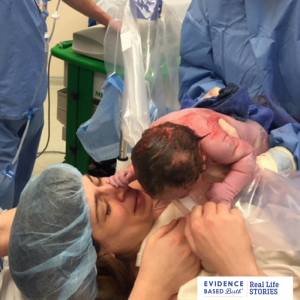 Coming to terms with having a Cesarean was difficult, but the big picture was a happy and healthy baby boy and medical staff who did everything they could to help with that process. My first child was born via Cesarean after 24 hours of labor, including 3 hours of pushing. He was OP and asynclitic and never descended beyond 0 station. I was uneducated and had not known he was OP or that there were things I could have done to get him to turn both before and during labor. The intense back labor drove us to transfer from the free-standing birth center we were intending to deliver at to the local Baby Friendly hospital so I could get an epidural and, ultimately a c-section. His birth was nothing like what i had hoped for but ultimately was a positive experience. I was told we could do skin-to-skin and even breastfeed in the OR but when the time came I was so loopy I was unable to support him at all so my husband did skin-to-skin instead with our son inside his scrubs as he sat by my head. After that, I set out to learn all I could about the physiology of birth and did a lot of things different during my second pregnancy which ended in a perfect VBAC. It was everything I had hoped it would be. After that I felt very strongly that other women needed to know all the things that I had learned so I set out to become a doula and attended my first training in April 2014. When I became pregnant with our third child in January of 2015 it never even crossed my mind that I may need another c-section. I was educated and an experienced birth doula. I knew all the things to do to encourage optimal fetal positioning and I did them all. My experience meant that I was able to easily discern my daughter’s positioning. I knew she was OP and despite intentional movement, SpinningBabies and weekly chiropractic care, she just wouldn’t turn. I went into labor with her on Oct 15th at 41 weeks and 4 days. The labor progressed fairly quickly with the same excruciating back labor I remembered from my first labor. The way her head was flexed meant that when I was pushing it actually relieved some of the pressure in my back and when I stopped pushing my sacrum was on fire. I just couldn’t get a break no matter what we did and after laboring for 5 hours unmedicated (including 3 hours of pushing) I got an epidural with the full support of my midwife. I knew at that point, based on my first experience that we were probably moving towards a c-section but I opted to rest for an hour while trying some different positions and hoping that with me able to relax into the contractions she would turn. She didn’t. So, we tried pushing for another hour, hoping that maybe I would be able to push her out even in her sunny-side up position but it just wasn’t working and eventually we decided that a c-section was necessary. This time, unlike with my son, I was much more awake and aware. We requested a clear drape so I was able to see her being born and to announce her gender, which we had left as a surprise. I was also able to have her skin-to-skin for about 15 minutes before I became nauseated and needed my husband to hold her while I was sick. All in all, my second c-section, while more difficult to recover from physically, was much easier for me to process through mentally. This time I was educated and knew going into labor that she was not in an optimal position. I knew all the positions to try that would give her the most room to turn and I was able to push unmedicated. I had received chiropractic care, remained very active during my pregnancy and felt that we had done everything we knew how to do to enable a vaginal delivery. In the end, I just had to rest in the knowledge that the Lord is sovereign and while I don’t know why, in His good wisdom, the birth He ordained for my daughter included a c-section. I am thankful for the amazing support we had including my friend and doula, Joy Elliot (www.newcreationbirthservices.com); birth photographer, Morgan Vuznytzya (www.kindredspiritdoula.com); and the wonderful midwives and nurses from the Women’s Birth and Wellness Center in Chapel Hill, NC (www.ncbirthcenter.org). 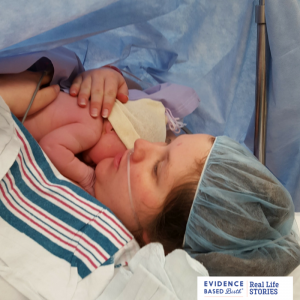 When Baby A (Ava) turned breach at 32 weeks, I had to open my mind to a c-section experience. After doing much research on the pros/cons/etc, I realized that it was possible to have a truly satisfying “belly birth”. 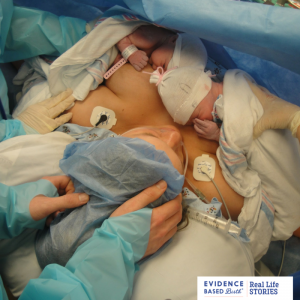 Called a “gentle c-section”, I asked my doctor to allow me to witness my babies being born by lowering the curtain, talking me through the process, allowing skin-to-skin immediately if possible, and allowing to initiate breastfeeding immediately. As we arrived at the hospital on the morning of April 28th at 7 am, we were escorted to a private room where we got immediate attention. Our nurses were wonderful. My platelet count was only 95, so I knew this was risky. The anesthesiologist came in to talk to us about options. He said he was recommending a spinal, and that I would be awake the entire time. I was thrilled. My biggest fear was that I would need general anesthesia and be knocked out for the birth of my babies. A little after 9 am, I gave Dani, my mom, and sister a kiss, and they wheeled my bed into the OR. The last thing I remember Dani saying to me was “just sit back and watch the show.” The anesthesiologist talked me through the process, making small talk about yoga and such…. and then just a few minutes later, the numbness took over my legs. They turned me side to side on the OR table oscillating me like a carnival ride. Dr. Gregg walked in focused and confident. I remember trying to say hi to him, but he was too focused for small talk. He immediately designated a chair for both my husband and Doula (Dante), making sure to say that the more comfortable chair was for Dani. He started directing orders to the nurses. I remember saying “don’t start without Dani.” A few minutes later, Dani and Dante came in. I was filled with anticipation, nervousness, awe, and curiosity. The anesthesiologist kept poking me and asking if it felt sharp. I then asked if they had cut me yet, and to my surprise, they said yes. I was totally unaware that I was open. After that, I expected to see a baby immediately. But it took time. Dr. Gregg was careful, as I heard him say to his nurses, “go slow… nice and slow.” He was calm and collected as he guided his crew. The funny thing was that even though there were probably 20 people in that OR, I only remember him, the anesthesiologist, my doula, and Dani. 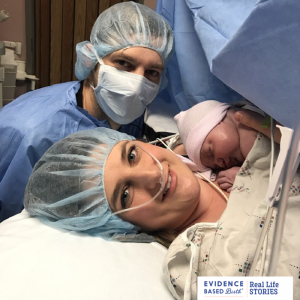 Then out of no where, I heard Dr. Gregg say “lower the curtain… Amy wants to see her babies be born!” As they lowered the curtain, I saw a head, Ava’s head, emerge, then her body, slow and steady, emerging from my womb at 10:16 am. Tears filled my eyes as I realized this was just as much a birth as a vaginal birth. They showed me my daughter, then took her to her bassinet. Dr. Gregg asked if I wanted the curtain raised. I said a stern, “NO”. I couldn’t believe I was allowed to witness this. So he allowed the curtain to stay down as my next two babies entered the world. One minute later, another head emerged, Baby B, Avi. Screaming, as he entered the world, I was amazed. He was also whisked to his bassinet. Then I saw Dr. Gregg raise my belly skin high. I felt pressure as he wiggled down Baby C, directing his crew to move slowly and patiently. He was sitting high, so it felt like a struggle to get him out. But only a minute later at 10:18, Ari made his debut. Filled with amazement, anticipation, and awe, the A-Team had arrived. Literally minutes later, they placed Ari in my arms. Then side by side, all 3 of them were in my arms. I squeezed them tight, as I cried with happiness as the nurses told me they were ALL healthy. Dr. Gregg came to my side as his crew was still stitching me up, and said “You did Great! This was the perfect time.” Then he shock Dani’s hand, and said “Congratulations.” A few nurses assisted me in trying to get the babies to latch while they were still sewing me up. After about another 20 minutes or so, they wheeled me out of the OR with all three of my babies on my chest. We arrived back in the room we started in, and were greeted by my mom, sister, Georgette, and Melissa. We sang “Happy Birthday” in hebrew “Yom Hooledet Sahma-ach” as we stared at these fresh new lives. Like most of you, I have had many family and friends who have given birth surgically by C-section. 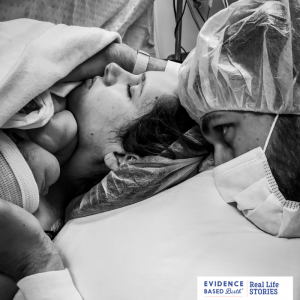 This is one of the main reasons why at Evidence Based Birth®, I am committed to writing about evidence-based maternity care for all women—no matter how or where your birth takes place. 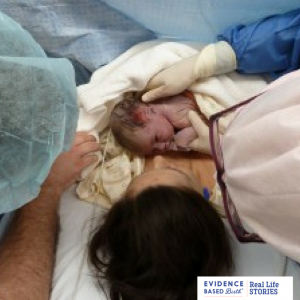 A few months ago, I wrote about the evidence for skin-to-skin care after a Cesarean. Medical evidence clearly shows that mothers and babies should stay together and have skin-to-skin care after uncomplicated births– no matter whether the birth is surgical or vaginal. Routine separation of healthy moms and healthy babies is not evidence-based care. 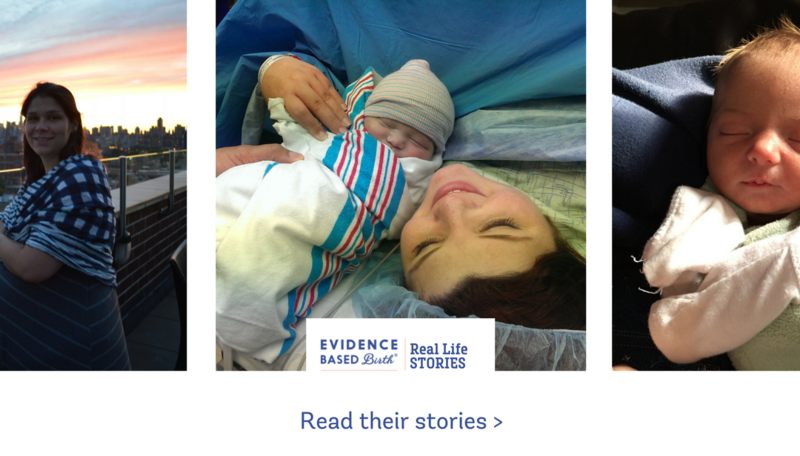 I believe that Beth is in a unique position to provide a testimonial about evidence-based practice after a C-section. 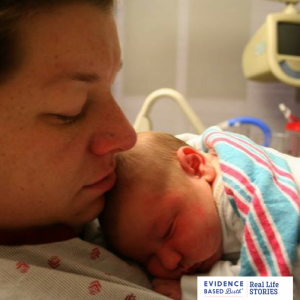 Beth was separated from her baby after her first surgical birth and was not offered skin-to-skin care. 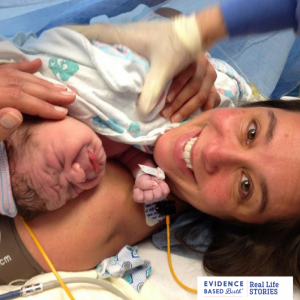 A few years later, she had a repeat Cesarean at the same hospital. This time she had a radically different experience. 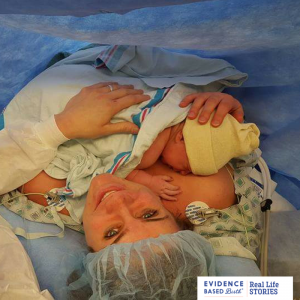 Read her story to find out what made her two births so different. My name is V.F. I live in Australia, I’m studying to be a doula and have a one year old girl. I have a neurological condition which causes muscle weakness and requires me to use a wheelchair. The pregnancy was not easy – I had a severe case of morning sickness (aka hyperemesis gravidarum) for the first few months, the weight of my belly affected my mobility further and I had excruciating pubic symphysis pain for the last couple of months. I had a plan and every intention to have a natural birth but on my due date exam my daughter was in a funny position (sitting with her shoulder/neck to the cervix, possibly caused by a severe scoliosis I have) and after considering all risks (including possible cord prolapse as head wasn’t fixed in the pelvis) and much deliberation, I agreed it’s safer to go with my doctor’s suggestion to have a Caesarean. I insisted on having the surgery be as family-friendly as possible and my daughter was born 3 days after her due date. I am a DONA certified birth doula and birth doula trainer, and a Lamaze Certified Childbirth Educator teaching independent birth classes through my practice, New Moon Birth. I also train childbirth educators through Passion for Birth and am a co-leader of the Seattle chapter of ICAN (International Cesarean Awareness Network.) I live in Seattle, have been doing birth work for about 10 years and have two daughters and a crazy golden retriever. I also am the community manager over at Lamaze International’s Science & Sensibility blog. 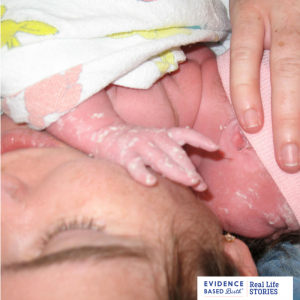 To learn more about the evidence, read our article on the The Evidence for Skin-to-Skin Care after a Cesarean.